We are also available to lay down footings for your wall even if you don't want the wall to be built by us. If you want any further information regarding walls or a free no obligation quote then feel free to contact us. Many people do not quite understand which boundary wall they require. Circumstances do predict style and bond. Whether it is a divider between two properties or a wall to support a sharp increase of levels. Usually constructed by building two 100mm walls with tie between for strength and also to give a fair face on both side which is then finished off with a coping stone. This kind of wall is perfect for a divider between two properties where the cost of the wall can be shared by both parties. A single 100mm wall is not ideal for boundaries due to limitations on how high you can build it. In some cases, the higher it goes, the weaker it becomes unless pillars are added at regular intervals for strength. Be aware that a common house brick is manufactured with only one side having a good face. 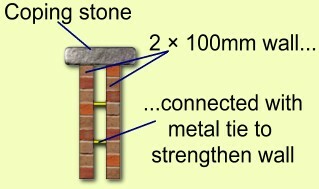 If built in this way, either you or your neighbour would end up with the unfinished side of the brick facing them. 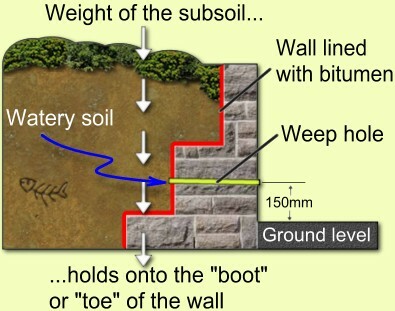 The illustration shows how a retaining wall is designed specifically to hold back the weight of sub-soil. The back face of the wall (Shown in red) is protected by bitumen (Better known in the trade as tanking) to prevent mould growth through the front face of the wall. Weep holes are pipes which are designed to allow water to escape from the sub-soil. This prevents any possibility of excessive weight building up behind the wall which could potentially cause the wall to collapse. Dry stone walling is so called because it doesn't use mortar to bond them together. These are mainly built to separate livestock in rural areas. Unique pieces of stones are used to form the finished wall. This look fits in with projects such as barns conversions and farmhouse restorations as this is a typical countryside look. Diaphragm wall are built with extra strength in mind. Two 100mm walls are supported by a buttruos wall between. These kind of walls are typically used in school gymnasiums and leisure centers due to their height. A dwarf wall is a wall constructed usually to a maximum of 750mm high. It is mainly built to section off boundaries on properties or round areas in gardens. A good example of a dwarf wall would be to look at the construction of the majority of conservatories. These are made up of the upvc window sections and roof which are secured onto a "dwarf wall." The Government planning portal is a useful source which covers useful information relating to planning permission on fences, gates and garden walls which also covers 1996 Party Walls Act.